Update: Apple has contacted Stuff and they posted a clarification post. Stuff Middle East has posted a report claiming there is an “Official Apple Store to open in UAE”. Upon reading the report it turns out that it is just a Virgin Megastore section specializing in Apple products. We reached out to Apple PR and inquired about this report. Apple responded saying that Stuff’s story is incorrect and Apple will contact them to correct it. Apple also noted that the image is incorrect as it is a picture from an Apple Retail Store. The story also mentions Geniuses incorrectly. 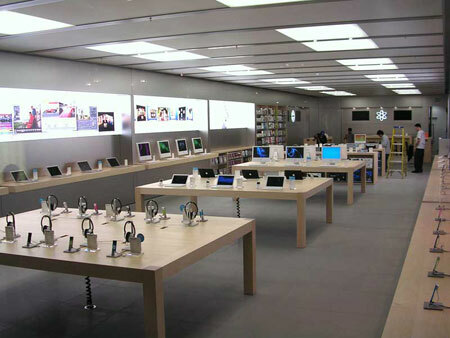 Apple never opened a retail store in a country without opening a support center and online store first. Personally I thought it was obvious that it’s not an Apple Store but I had to confirm it with Apple. The original story noted that the photo wasn’t actually of the Dubai store. I also recognized the photo as the one I took at the Mall of Columbia (Maryland, U.S.) store back in 2006 when the store held its grand opening. The Mall of Columbia store was the very first full-size store to feature the Version 2.0 interior design: stainless steel, back-lit graphics, stone floors. They want us to be robbed by the hands of their resellers in the Middle East.